This is the project that was a bee in my bonnet. The other night I was reading Corduroy to Oscar and Freeman’s illustration of a quilt on the girl’s bed caught my eye. I love the "randomly tossed down squares" look of it and I thought that it’d be a cute quilt to make out of outgrown kids clothes. The old dress quilt. I have a disproportionately large selection of pinks in my fabric collection so these are what I started grabbing to give this design a go. I just cut out (freehand) large-ish squares and started sewing them down with a zigzag stitch. I have no idea how to quilt it or who the recipient will be and I’m not sure how successful the design is but I think I may like it a lot. Maybe it’s all the dizzying pinks confusing me. I’ll have to live with it for a while and see what kind of a relationship develops. For now it’s on to more pressing matters, maybe a Halloween costume for Oscar?! ** thanks for the great input! the size is what I thought would be good for a kid’s napping quilt, about 42" x 60". I’m definitely going to leave the border around the edges – not put squares all the way to the edge – that’s my favorite part! I’m still undecided about covering up all the green underground bits that are peeking through. and still have no ideas on quilting. I like both suggestions – an overall stipling or 2 different patterns, one for patches and one for the green. I did nothing to finished the squares’ edges. I’m hoping the zigzag and then the quilting is enough to keep them in place without too much fraying. Nope, no pocket for corduroy but the finished project may have a button sewn on just in case Corduoy needs one. That is so gorgeous! I love it! The design and colours are beautiful. So clever! The randomness looks great. I like the pinks. You can totally ignore this suggestion, but maybe it would pull together if you covered up every last scrap of the green background that’s showing through with tossed aquares. It would definitely make it even busier and pinker, but I think it would also look really good. Eh, or whatever…I like this idea alot! I like it, Hillary! I think you’ve really captured the look of the illustration! Will the squares go all the way to the edge? I love it! And I actually like the green border. I’m having fun imagining how you might quilt it. Maybe you could have one pattern for the green and another for the squares to keep up the look of the squares being tossed onto the green background. Can’t wait to see the finished product – you’ve been giving me so many ideas for my christmas and baby gift quilts. Beautiful! I lost count of how many times I had to read Corduroy to Elvira today! We got is as a present from mav at Port2Port and it’s been one of her favorites ever since! i luv this! what a great idea…esp. if you are using your children’s clothing. i wish i even knew where to begin with a quilt…then i could give this project a go. what a lovely concept! so cute how you got it from the corduroy book–this could be something i could do with the boy’s old aloha shirts. thanks for the idea! very cool. did you see the pink pillow i just did? it’s similar but more uniform.i love pink. and i love what you did here. i love the randomness of it. and i love that you got inspiration a small object from an illustration in a children’s book. marvelous. I’m loving this…moreso than a crazy quilt. What an inspirational idea. I love the idea of using old clothing and/or tee shirts. What a great memory quilt idea. Hmmmm….something else to add to my “to do” list. I really like how you see something in a book that inspires you and then you whip up a quilt just like that. You are amazing!! Did you do anything to the edges of the fabric squares like fold them under or is the zigzag stitch enough to keep them from fraying when the quilt is washed? Inquiring minds want to know! Wonderful idea!! why not do a stippling(not sure I spelled that right)for the quilting? you can do it freehanded and make your own pattern, as you did with the quilt top..its a great looking piece!! Very cute. And while you were at it, did you make a pocket for Corduroy? It´s so cool!! I like it very much, it’ s a great idea! I love this! Corduroy was one of my favorite books as a child and I already have a copy (or three) reserved just for my son. I really like the green peeking through in between the squares and especially the green border. Could you quilt around each square (stitch in the ditch even though technically there isn’t one)? I absolutely love this! And Corduroy too. Really lovely! This would be fun with funky vintage (bordering on cheesy) handkercheifs too. Wow, that’s a fabulous idea. I love the colours… pink and green, so great! That looks so awesome! I like how a little bit of the green peeks through between some of the squares! I think it balances it. 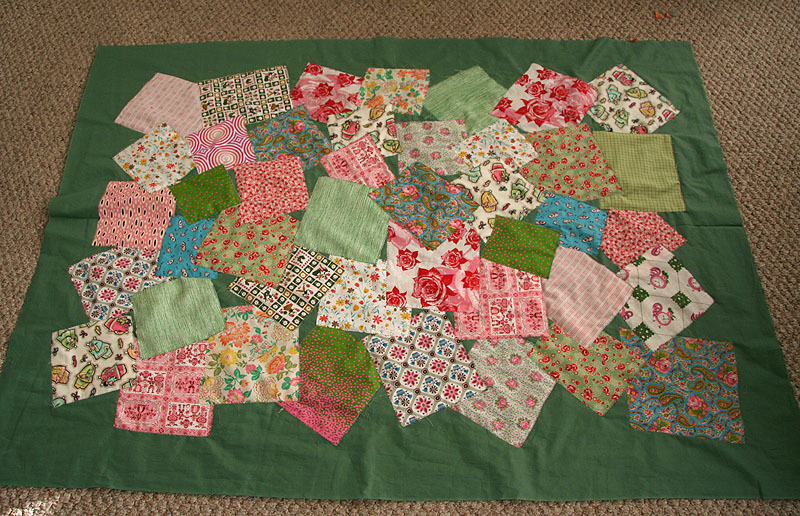 Maybe for quilting it you could do a border along the green border thendo embellishments on each square (like around the flowers or little people or that sort of thing). It would be time consuming, though, so maybe that’s a nutty idea. I love this quilt and I’m definitely thinking I’m going to do a similar sort of memory quilt with my son’s first year clothes. You’re very inspiring in that you decide to do something and you actually do it. I have all these ideas in my head and unfortunately that’s where most of them tend to stay. Need to be more of a doer. Wow! I love the quilt. this is an awesome idea! i’ve been struggling to decide which quilt to make for my new room i’m moving into next week and i think this is it! i’ve been collecting scraps of material from my travels and buying bits i like for years, and this is a perfect way to showcase them all. i love your pinks! Hey Hillary! 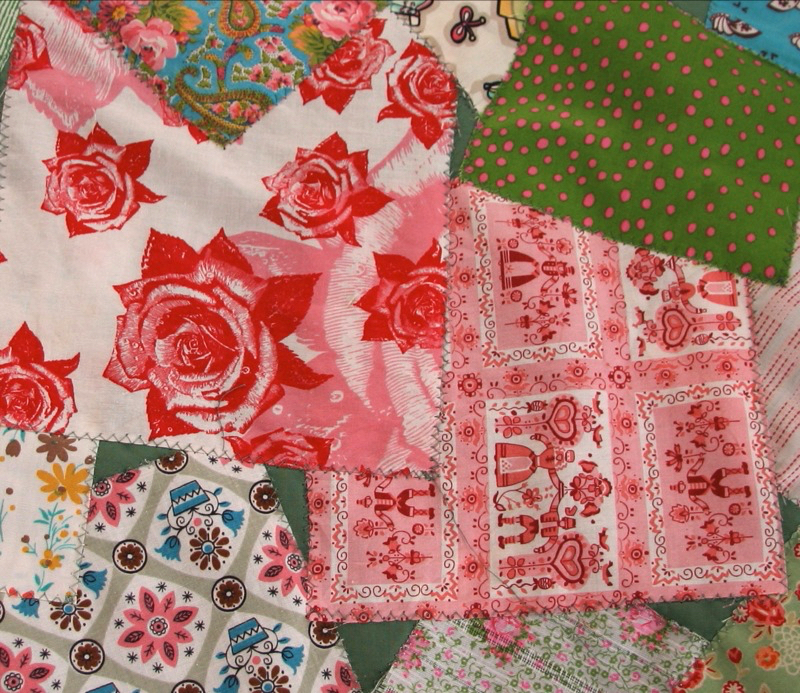 I have been revisiting all your old quilts because I just love them! Wondering if you will post an update on some of them and how they have held up, etc. I would love to know how the zigzagging held up on this particular quilt. Yeah, a “where are they now?” of quilts post would be fun!